European Project Management Journal is an academic journal that aims to present the most recent knowledge in the fields of project management and other specialized management disciplines. The Journal maintains the balance of content between research, technique, theory, and practice. Submissions from researchers addressing the art and science of project, program and portfolio management according to an interdisciplinary perspective are especially encouraged. Every submitted article undergoes a double-blind review process to ensure that only high-quality papers are published. The audience for this publication includes academics, executives, project practitioners, business leaders and other individuals who seek to improve their project management skills and practices. It is our genuine wish in launching this journal to contribute to the further project management development and implementation in Serbia. The publications are visible on EBSCO, Google Scholar, and SCI index. 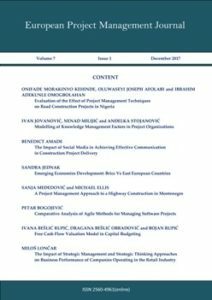 European Project Management Journal, that was published under the name Serbian Project Management Journal (2011-2016), is issued by Serbian Project Management Association – IPMA Serbia two times per year.